“Discovering Raw Alkaline Cuisine” cookbook was born during cooking classes Chef Sal gave for a passionate alkaline foods lifestyle consultant. Who is Chef Sal? 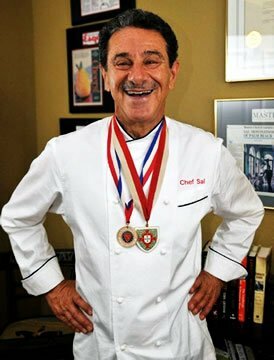 Chef Sal has a deep love for cooking and an extensive 55 year career as a chef. He started out training in culinary arts across Holland, Switzerland, France, Singapore, Israel, and Spain. He was a dining captain on a cruise ship until he decided to make America his home and start a restaurant of his own. He opened Déjà Vu in Philadelphia, serving some of his favorite dishes honed during his schooling and travels — and recreating them with a healthy flair. The restaurant took off, winning multiple awards and garnering great reviews from the nation’s most esteemed culinary press. In his book, you will find all types of different choices. They include Appetizers, Entrees, Beverages, Snacks, Deserts, Sauces, Dressings, Salads, and Soups. He created all of the alkaline recipes with the taste and texture of the most favorite foods in mind. They are, for example, Kebabs w/ Barbeque sauce, Veggie Burgers, Hummus, pizza and even ice creams and tortes. There are over 120 different alkaline recipes in “Discovering Raw Alkaline Cuisine” that can bring you from beginner in health alkaline foods to advanced levels. Most of the alkaline recipes call for the use of a food processor, blender, dehydrator and/or juicer. These alkaline recipes generally can be prepared after a trip to the local health food store. For others, you may need special ingredients that you can easily replace with something other suggestions. “Discovering Raw Alkaline Cuisine” will benefit you whether you want to casually experiment or take complete control of your health goals.